I recently went through the statistics for search queries on the blog, and one that came up was "violin and osteoporosis," which I thought was worth addressing. We typically think of osteoporosis as something that old fragile ladies get, but frankly, it's something worth thinking about for both men and women, especially as we move past the peak bone density period of our twenties. Simply put, osteoporosis is weakness of the bones, which causes them to be more brittle and susceptible to breakage. The precursor to osteoporosis is osteopenia, meaning low bone mass. Our bones are in a constant cycle of regrowth (ossification) and resorption (removal). These two processes remain in balance throughout our youth, but as we age, there is often more resorption, and less ossification. This is turn can cause a reduction in bone mass (osteoblast cells are less active than osteoclasts). 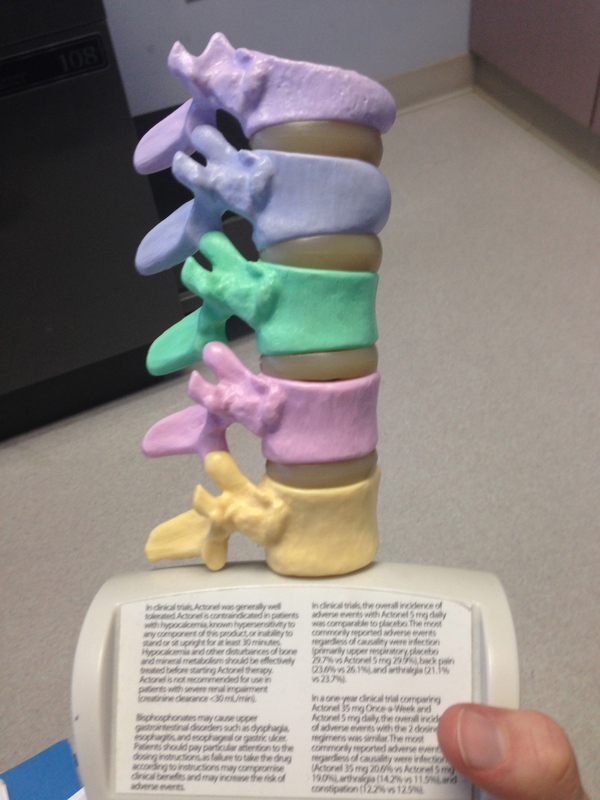 When I was at my doctor's office, I took a few pictures of this model spine, which shows a range of spinal issues. Focus on the bottom three, (green, pink, and yellow), which compares bone density for osteoporosis (green), osteopenia (pink), and normal (yellow) bones. Notice how large the porous surfaces are with the osteoporosis? This image is a bit more difficult to process, but do you see the shape of the vertebrae is actually different? The top four vertebrae are all compressed, whereas the healthy bone on the bottom is normal shaped and the disc isn't compressed either. The top two vertebrae are fractures (anterior wedge and compression) and green is osteoporotic and pink is osteopenic. From a musician point of view, we want to keep our bones healthy and prevent fractures to our axial skeleton (spine, neck, sacrum, etc.) Healthy bones permit a long lifetime of music-making. Katy Bowman has a few great articles on osteoporosis as well as a great podcast on bones. Buff Bones is a great exercise program developed by Rebekah Rotstein addressing osteoporosis and osteopenia. Yoga For Osteoporosis in the Huffington Post: I don't love the demo pictures in terms of alignment, but the content is solid.